With more than 200 partners in attendance, Microsoft has honoured local and regional partners who have shown commitment to effective engagement, excellence in innovation and competitive communication. Microsoft recognised partners across three broad categories, namely learning partners, technology for social impact, and partner seller excellence in technology and/or sales recognition. NTUC Learning Hub received the award for learning partner (community) while NetAssist Services took the learning partner (solutions) award. On technology for social impact, the award went to Total eBiz Solutions, Feezmodo Consulting and iShine Cloud Limited. The partner seller excellence in technology and/or sale recognition award went to Ivan Chan from T-Systems Singapore, Othniel Liew from Singtel, and Martin Lonneryd from Telstra Singapore. The top partner award of the night went to Ingram Micro who received the country partner of the year award as well as the cloud solution provider (indirect) partner of the year award. “Ingram Micro in the last four years has moved towards a cloud model as has Microsoft,” said Francis Choo, vice president and chief executive, ASEAN and HK at Ingram Micro. “We have bet very big on Microsoft. We are trying to create our own marketplace across the region so while Microsoft transformed we collectively transformed with them." The 2018 Microsoft Singapore winners and finalists represent the best and most forward-thinking innovators. “They bring cutting-edge solutions to complex business challenges and provide digital transformation opportunities for their customers," said Gerald Leo, director for One Commercial partner, and small and midmarket corporate at Microsoft Singapore. 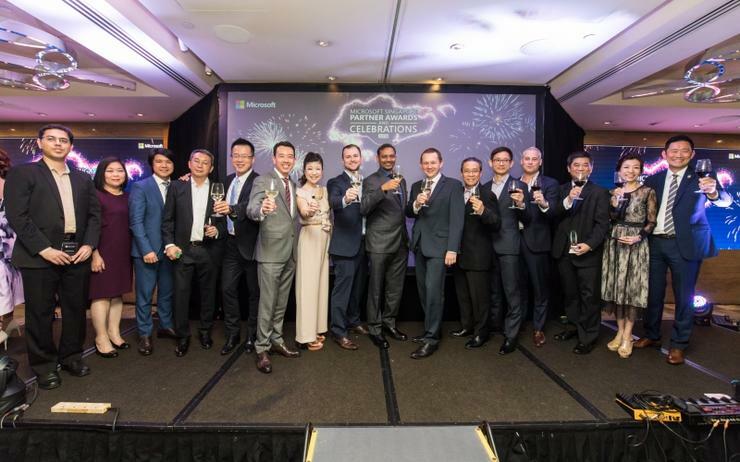 During his opening address, Kevin Wo, managing director at Microsoft Singapore, highlighted significant recent achievements the vendor’s Singapore office has achieved and credited partners as a key pillar of that success. One such feat was being awarded the subsidiary of the year in the developed medium cluster. A significant achievement that took 12 years to bring the cup back to Singapore. Wo pointed out that as the subsidiary of the year his team has come up with the theme ‘winning together,’ sharing three attributes that constitute winning together for his team. The first was building trust, “a partnership can never be successful and not built on a foundation of trust,” said Wo. The second attribute was about creating a multiplying effect, “if all my partners can think about bringing another practice, another solution to their set of offerings, how can they differentiate better?” said Wo. “If partners can think about coming together to bring the best of Microsoft’s offerings to help our customers to solve software in the most complex problems that they are facing that is about the multiplying effect and I think we need to continue to think about how we create that within our ecosystem,” added Wo. The third attribute is about execution with excellence. “We can never be based on aspiration and never having a clear intentional partnering to realise some of the outcomes for our partners and for Microsoft,” said Wo. Furthermore, the vendor underwent a significant transformation a year ago with the launch of its One Commercial model. “This new operating model is meant to accelerate our customer and partner success in the digital transformation journey. It is also about helping us as a company to grow significantly in our cloud and increase our market share,” added Wo. This is a critical milestone for Microsoft enabling a much more comprehensive relationship with partners, to build technology with partners, to go to market with partners, and to be able to sell with partners as well. Microsoft also revealed AI as a significant focus for the vendor and one where partners will play a significant role going forward. “The rise of the AI is really changing the face of the business and radically transforming the way how we work, play and get the job done,” said Wo. Microsoft has developed an AI country plan to plot the road ahead for the vendor, with senior executives sitting on Singapore ethics counsel for AI and advising local universities in regards to the education curriculum for AI. Further, Wo revealed that Microsoft will be hosting its Singapore partner conference 7 November with an inaugural AI event called the Microsoft FutureNow, allowing partners to explore how AI scenarios can help to transform the industry.